YumUniverse, which featured two of my recipes: Mini apple pies à la mode and Steamed Buckwheat-Stuffed Kale Leaves, both of which I entered in the very fun recipe contests hosted on the site. 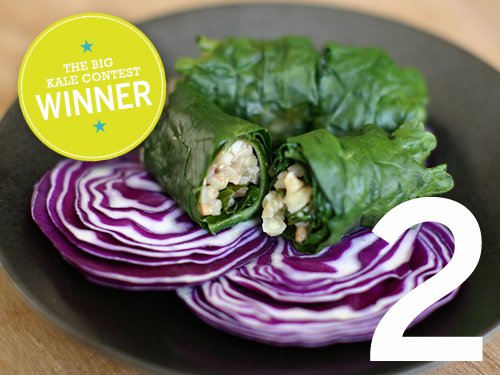 The latter won second place in the Big Kale Contest. My Moong Dal Vegetable Curry recipe also won a YumUniverse contest and was included in the amazing YumUniverse Cookbook. Such an honor! You can pick up your copy here and I highly recommend it. FoodGawker has chosen my Tartes aux Fruits, Thai Buckwheat-Stuffed Kale Leaves, Pistachio Arugula Pesto, Garlicky Heirloom Tomato Sauce and Moong Dal Vegetable Curry to display on its site. Finding Vegan has featured many of my recipes, and I am extremely grateful for the opportunity to share them with a wider audience on this fantastic site. My Inspired Vegetable Broth and Açai Bowl were selected for TasteSpotting, the finest collection of food blog images I’ve found on the web. My Pistachio Arugula Pesto recipe was featured on the fun women’s lifestyle site Glitter Guide, in an article entitled Market Fresh: 10 Foods for Spring. Chickpea Magazine selected my Tartes aux Fruits recipe for its Summer 2013 issue. This is a fun and visually stunning vegan quarterly magazine that offers electronic and print subscriptions. I definitely recommend checking it out!